Adaptec - 1961900 ADAPTEC - 2410SA KIT 4CHANNEL 64BIT 66MHZ PCI SATA RAID CONTROLLER WITH STD. BRACKET (1961900). NEW BULK. IN STOCK. SHIP SAME DAY. 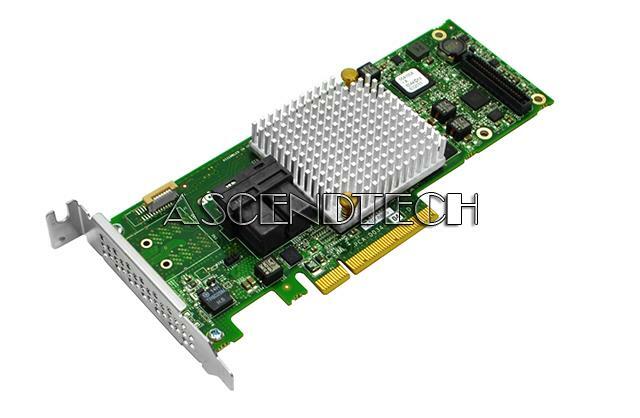 Adaptec - 2255900-R ADAPTEC - 1220SA DUAL CHANNEL PCI SATA300 RAID CONTROLLER CARD. NO CABLE. (2255900-R). NEW FACTORY SEALED. IN STOCK. SHIP SAME DAY. IBM - 39R8810 IBM - SERVERAID 7T 4CHANNEL 64BIT 66MHZ PCI SATA RAID CONTROLLER (39R8810). NEW BULK. IN STOCK. SHIP SAME DAY. 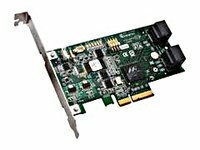 Hewlett Packard - 431103-001 HP/COMPAQ - LSI3041E 4PORT PCI EXPRESS X4 SAS/SATA RAID CONTROLLER CARD (431103-001). NEW BULK. IN STOCK. SHIP SAME DAY. Adaptec - RAID 51645 daptec RAID 51645 SATA/SAS 20-port (16 internal 4 external) 512MB PCI Express X8 Controller Card 2258600-R.
IBM - 39R8765 IBM - SERVERAID-8S SAS PCI-EXPRESS X8 SAS/SATA RAID CONTROLLER WITH 256MB CACHE (39R8765). NEW BULK. IN STOCK. SHIP SAME DAY. Adaptec - 2260300-R ADAPTEC - 2045 4 PORT SATA/SAS PCIE 8X RAID CONTROLLER CARD WITH 128MB DDR2 CACHE. NO CABLE. NEW RETAIL FACTORY SEALED.(2260300-R). IN STOCK. SHIP SAME DAY. 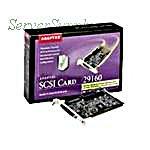 Adaptec - ASR-2045 ADAPTEC - 2045 4 PORT SATA/SAS PCIE 8X RAID CONTROLLER CARD WITH 128MB DDR2 CACHE. NO CABLE (ASR-2045). NEW RETAIL FACTORY SEALED. IN STOCK. SHIP SAME DAY. 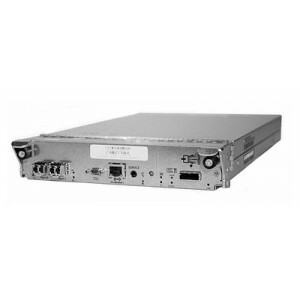 Adaptec - 2241000-R ADAPTEC - RAID 1430SA - STORAGE CONTROLLER (RAID) - 4 CHANNEL - SATA-300 LOW PROFILE - 300 MBPS. NO CABLE (2241000-R). NEW BULK. IN STOCK. SHIP SAME DAY. 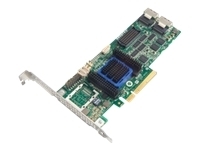 IBM - 39R8785 IBM - SERVERAID-8S SAS PCI-EXPRESS X8 SAS/SATA RAID CONTROLLER WITH 256MB CACHE (39R8785). NEW BULK. IN STOCK.SHIP SAME DAY. 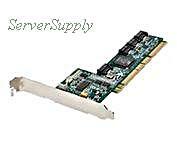 IBM - 46M0831 IBM - SERVERAID M1015 8CHANNEL PCI-E X8 SAS/SATA RAID CONTROLLER (46M0831). NEW BULK. IN STOCK. SHIP SAME DAY. IBM - 46M0861 IBM - SERVERAID M1015 8CHANNEL PCI-E X8 SAS/SATA RAID CONTROLLER (46M0861). NEW BULK. IN STOCK.SHIP SAME DAY. 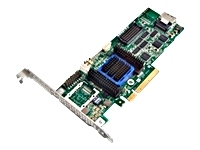 LSI Logic - LSI00118 LSI LOGIC - MEGARAID SAS 8344ELP PCI EXPRESS X4 8CHANNEL SATA-300/ SAS RAID CONTROLLER (LSI00118). NEW BULK. IN STOCK. SHIP SAME DAY. 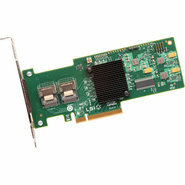 LSI Logic - LSI00199 LSI LOGIC - MEGARAID 9240-4I 6GB/S 4PORT PCI EXPRESS 2.0 X8 SAS/SATA RAID CONTROLLER. NO CABLE (LSI00199). NEW BULK. IN STOCK. SHIP SAME DAY. 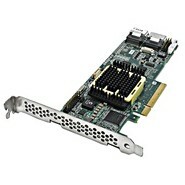 LSI Logic - LSI00203 LSI LOGIC - MEGARAID 9240-4I 6GB 4PORT PCI EXPRESS 2.0 X8 SATA/SAS RAID CONTROLLER WITH CABLE AND LP BRACKET (LSI00203). NEW RETAIL FACTORY SEALED. IN STOCK. SHIP SAME DAY. 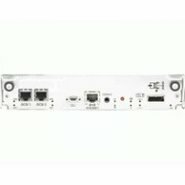 LSI Logic - LSI00191 LSI LOGIC - 9211-4I 6GB 4PORT INT PCI EXPRESS X4 SATA/SAS RAID CONTROLLER WITH LP BRACKET AND CABLE (LSI00191). NEW RETAIL FACTORY SEALED. IN STOCK. SHIP SAME DAY. 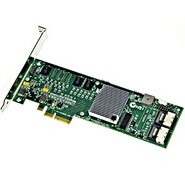 Adaptec - ASR-8805 Adaptec ASR-8805 12Gb/s PCIe Gen3 SAS/SATA Raid Controller Adapter Interface Card with Half Height Low Profile Bracket 2277500-R.
Adaptec - 2270000-R ADAPTEC - 6405 4CHANNEL PCI-EXPRESS 2.0 X8 LOW PORFILE SAS SATA RAID CONTROLLER WITH LP BRACKET. NO CABLE (2270000-R). NEW RETAIL FACTORY SEALED. IN STOCK. SHIP SAME SAY. 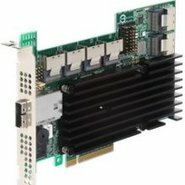 Adaptec - 2251800-R ADAPTEC - 3405 4CHANNEL LOW PROFILE PCI EXPRESS SAS/SATA RAID CONTROLLER WITH 128MB CACHE ROHS (2251800-R). NEW FACTORY SEALED. IN STOCK. SHIP SAME DAY. 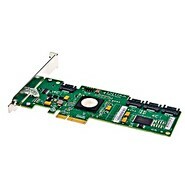 Adaptec - 2258200-R ADAPTEC - 4CHANNEL PCI EXPRESS LOW PROFILE SAS/SATA RAID CONTROLLER ROHS WITH 256MB CACHE. NO CABLE (2258200-R). NEW BULK. IN STOCK. SHIP SAME DAY. 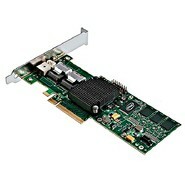 Adaptec - 2258100-R ADAPTEC - 4CHANNEL PCI EXPRESS X8 LOW PROFILE SAS/SATA RAID CONTROLLER WITH 256MB CACHE. CABLE INCLUDED (2258100-R). NEW RETAIL FACTORY SEALED. SHIP SAME DAY. IBM - 46M0829 IBM - SERVERAID M5015 PCI-E X8 SAS/SATA RAID CONTROLLER (46M0829). NEW RETAIL FACTORY SEALED. IN STOCK. SHIP SAME DAY. Intel - SRCSASBB8I INTEL - RAID CONTROLLER SRCSASBB8I - STORAGE CONTROLLER (RAID) - 8 CHANNEL - SATA-300 / SAS - 300 MBPS (SRCSASBB8I). NEW BULK. IN STOCK. SHIP SAME DAY. 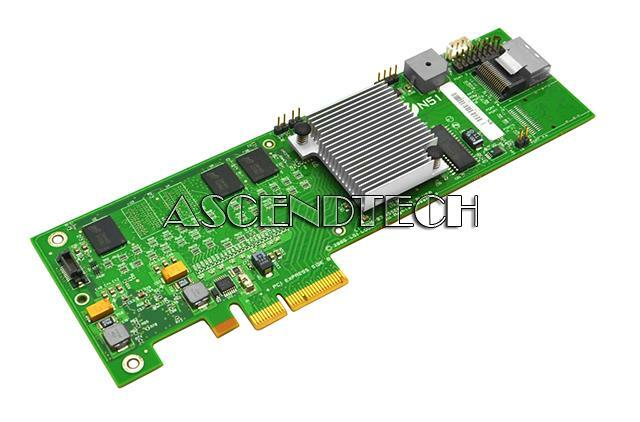 LSI Logic - LSI00198 LSI LOGIC - MEGARAID 9260-8I 6GB/S 8INTERNAL PORT PCI EXPRESS X8 SAS/SATA RAID CONTROLLER WITH 512MB CACHE. NO CABLE (LSI00198). NEW FACTORY SEALED. IN STOCK. SHIP SAME DAY. 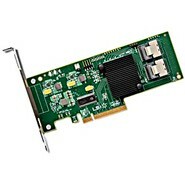 Intel - SRCSASRB INTEL - 8CHANNEL PCI EXPRESS X4 SATA-300/SAS LOW PROFILE RAID CONTROLLER WITH 256MB CACHE (SRCSASRB). NEW BULK. IN STOCK. SHIP SAME DAY. 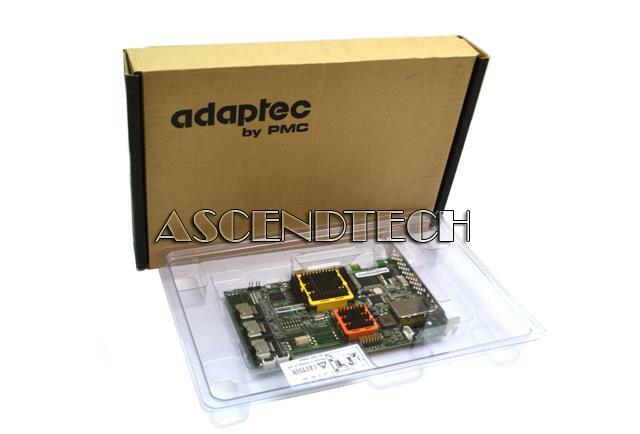 Adaptec - 2270100-R ADAPTEC - RAID 6805 - STORAGE CONTROLLER (RAID) - 8 CHANNEL - SATA-600 / SAS 2.0 LOW PROFILE - 600 MBPS - PCI EXPRESS X8. NO CABLE (2270100-R). NEW FACTORY SEALED. IN STOCK. SHIP SAME DAY. 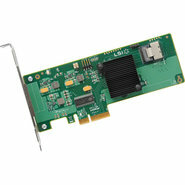 LSI Logic - LSI00141 LSI LOGIC - MEGARAID SAS 8708ELP 8 CHANNEL PCI EXPRESS X4 SATA-300 / SAS LOW PROFILE RAID CONTROLLER WITH 128MB CACHE (LSI00141). NEW BULK. IN STOCK. SHIP SAME DAY. 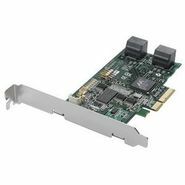 Adaptec - 2244100-R ADAPTEC - 8CHANNEL PCI EXPRESS SATA/SAS LOW PROFILE RAID CONTROLLER 512MB CACHE INCLUDES CABLE (2244100-R). NEW FACTORY SEALED. IN STOCK. SHIP SAME DAY. Adaptec - 2228800-R ADAPTEC - RAID 5445 - STORAGE CONTROLLER (RAID) - 8 CHANNEL - SATA-300 / SAS LOW PROFILE - 300 MBPS WITH CABLE AND LP BRACKET (2228800-R). NEW RETAIL FACTORY SEALED. IN STOCK. SHIP SAME DAY. 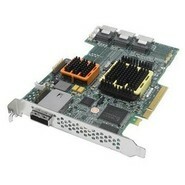 Adaptec - 2252200-R ADAPTEC - 3805 8CHANNEL PCI EXPRESS X4 SATA/SAS LOW PROFILE RAID CONTROLLER R0HS WITH 128MB CACHE (2252200-R). NEW BULK. IN STOCK. SHIP SAME DAY. 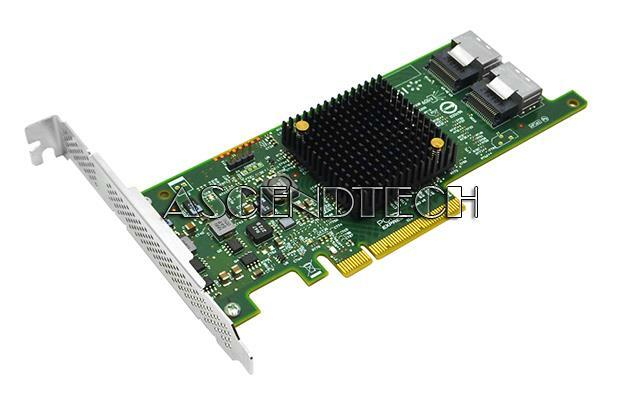 Adaptec - 2271200-R ADAPTEC - 6805 8 CHANNEL PCI-EXPRESS X8 LOW PROFILE SAS SATA RAID CONTROLLER WITH 512MB DDR2. INCLUDES CABLE AND LP BRACKET (2271200-R). NEW RETAIL FACTORY SEALED. IN STOCK. SHIP SAME DAY. 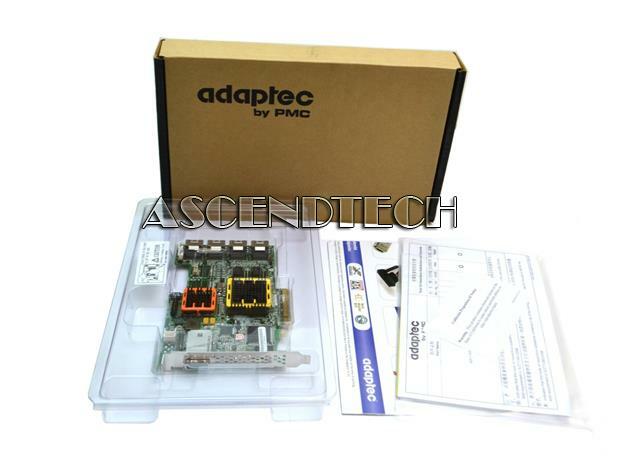 Adaptec - 2267000-R ADAPTEC - RAID 5445Z - STORAGE CONTROLLER (RAID) - 8 CHANNEL - SATA-300 / SAS LOW PROFILE - 300 MBPS - PCI EXPRESS X8. NO CABLE (2267000-R). NEW BULK. IN STOCK. SHIP SAME DAY. 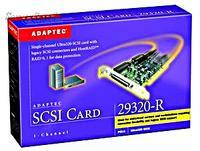 Adaptec - 2268500-R ADAPTEC - MAXIQ 5805Q 8CHANNEL PCI-EXPRESS SATA-300 / SAS LOW PROFILE RAID CONTROLLER WITH 512MB DDR2 SDRAM (2268500-R). NEW BULK. IN STOCK. SHIP SAME DAY. 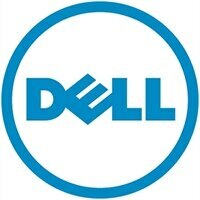 Intel - RS2SG244 INTEL - 6GB PCI-EXPRESS 24PORT INT 4PORT EXT X8 SAS SATA RAID CONTROLLER WITH 512MB CACHE (RS2SG244). NEW BULK. IN STOCK. SHIP SAME DAY. 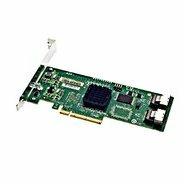 Hewlett Packard - 490092-001 HP/COMPAQ - STORAGEWORKS SATA/SAS RAID CONTROLLER FOR MSA2300FC (490092-001). NEW BULK. IN STOCK. SHIP SAME DAY. 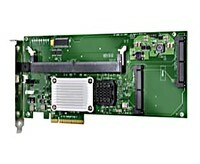 Hewlett Packard - AJ808A HP/COMPAQ - STORAGEWORKS MODULAR SMART ARRAY 2300SA G2 SAS/SATA RAID CONTROLLER (AJ808A). NEW BULK. IN STOCK. SHIP SAME DAY. 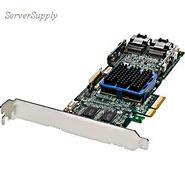 Hewlett Packard - AJ803A HP/COMPAQ - STORAGEWORKS MSA2300I SAS/SATA RAID CONTROLLER (AJ803A). NEW BULK. IN STOCK. SHIP SAME DAY. Hewlett Packard - AJ798A HP/COMPAQ - STORAGEWORKS SATA/SAS RAID CONTROLLER FOR MSA2300FC (AJ798A). NEW BULK. IN STOCK. SHIP SAME DAY.